The honour of the Battlefield Band's induction into the Scottish Traditional Music Hall of Fame in November 2016 is shared by all the excellent musicians who have passed through the ranks over nearly five decades as musical ambassadors of Scottish folk music. Their long-time producer and manager Robin Morton has chosen his 19 favourite tracks from 1977's self-titled "Battlefield Band" album to 2013's "Room Enough For All". Featuring a series of vocalists (Alan Reid, Brian McNeill, Jamie McMenemy, Sylvia Barnes, Sean O'Donnell, Karine Polwart, Davy Steele, Pat Kilbride, Jenny Clark, Alistair Russell) and pipers (Duncan MacGillivray, Ged Foley, Iain MacDonald, Mike Katz, Ewen Henderson), besides fiddlers, whistlers etc. (John McCusker, Alasdair White, John Gahagan). On 11th November 2016 Battlefield Band were inducted into the Scottish Traditional Music Hall of Fame. Over almost half a century these ambassadors for Scottish folk music have released thirty acclaimed albums and travelled thousands of miles, playing thousands of concerts worldwide. Great musicians have passed through the ranks - an Alma Mater that reads like a 'Who's Who'. Each brought new instruments, new compositions, new voices to the mix - learning much while adding a freshness and creativity, that became a real and widely quoted measure of quality. The band was formed in 1969 by four student friends from Strathclyde University (Brian McNeill, Jim Thomson, Alan Reid, Eddie Morgan) and took its name from the Glasgow suburb where Brian McNeill was living at the time. Their brand of music developed when Brian McNeill and Alan Reid were joined by Jen Clark (vocals, guitar, cittern, appalachian dulcimer and whistle) and Duncan McGillivray (pipes and whistle). Stand Easy, the album they recorded in 1979, still stands up as one of the band's finest. The next line-up included new comers Dougie Pincock (bagpipes) and Jim and Sylvia Barnes along with veterans Alan Reid (vocals and electric keyboards) and Brian McNeill (fiddle). The band has gone through many line up changes over the years. Alan Reid, who had been a member ever since and the last remaining founding member, finally left the band at the end of 2010, concentrating on his musical duo with guitarist & singer Rob van Sante who has been Battlefield Band's sound engineer for the past thirteen years. On 1 January 2015, Battlefield Band revealed in an e-mail sent to their fanbase that, back from their US tour in October/November 2014, they were working hard in the studio on a new recording project with the working title Beg, Borrow & Steal. The Irish / Scottish album would highlight and explore the cultural cross-fertilisation of the vibrant musical traditions of Scotland & Ireland and the group would collaborate with many other leading traditional musicians and scholars. Mick Moloney (USA/Ireland), Nuala Kennedy (Ireland), Aaron Jones (Ireland), Christine Primrose (Scotland), Alison Kinnaird (Scotland) & Barry Gray (Australia) were due to be all on board, with more to follow. The band has been awarded Creative Scotland assistance for this project. If all would have gone well as initially announced and expected, the recordings would have been available on Temple Records by March 2015 – it might even have turned into a tour if all would have gone well and the musicians would have been available. On 14 August 2015, Battlefield Band's label Temple Records finally announced that the (delayed) new album had been re-titled simply as Beg & Borrow and would be released as a digital download (and on streaming) on 21 August 2015, on CD in the UK on 18 September 2015 and on CD in the United States on 16 October 2015. Battlefield Band later confirmed that they would embark on 14 January 2016 on a 16-date tour of German-speaking countries (Germany, German-speaking Switzerland, Austria) including a radio show and a TV show in Germany, due to end on 31 January 2016. Battlefield Band were winner of "Best Live Act" at the inaugural Scots Trad Music Awards in 2003. 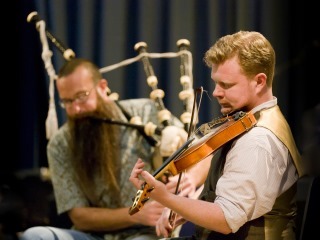 In 2011, they were winner of "Best Band" at the Scots Trad Music Awards 2011. 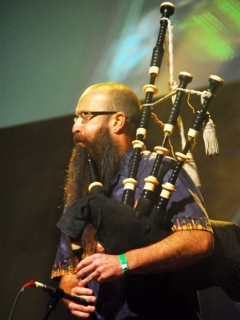 Battlefield Band's "Compliments to Buddy McMaster" (a track from its album Dookin' released in 2007) was nominated for the 7th Annual Independent Music Awards for World Traditional Song of the year. 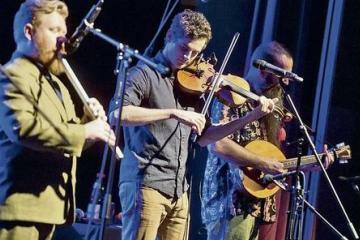 They also have been nominated for the 11th Independent Music Awards "World Traditional Song" category for its recording of "A' Bhriogais Uallach" ("The Pompous Trousers"), a track from their album Line-up released in 2011. 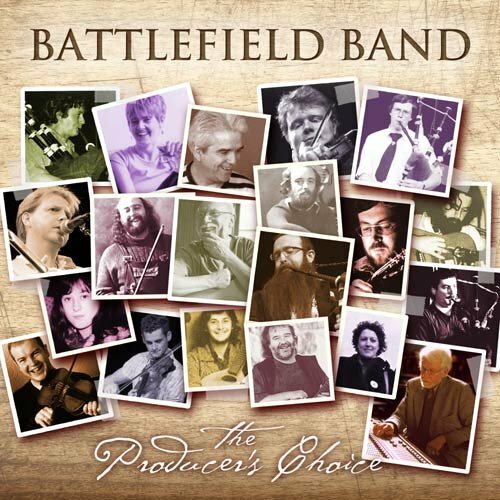 On 11 November 2016, Battlefield Band were inducted into Scottish Traditional Music Hall of Fame for "Services to Performance". Every line-up since the Stand Easy album has had at least one bagpiper. Unusual aspects of the instrumental line-up for a traditional band include the presence of electric keyboards and the absence of percussion. Every album mixes traditional Scottish songs and tunes with modern (often original) compositions. Themes range from drinking, friendship, and hard times to history, geography and politics. The band's 2006 album, The Road of Tears, deals explicitly with the theme of displacement. Many of the songs deal with emigration, both voluntary and forced. Battlefield Band's 2007 album, Dookin′ (the Scots word for what you do at hallowe'en – as in «"dookin" for apples») has a lighter feel, after the eloquently somber tone of The Road of Tears. Dookin' includes instrumentals and a mix of vocals, with lead being shared by Alan Reid and Sean O'Donnell. Sean O'Donnell [2005–present] (vocals, guitar) – Sean replaced former Irish vocalist and guitarist Pat Kilbride in July 2005. Alan Reid [1969–2010] (founding member; keyboards, guitar, vocals, accordion, melodica, Hammond organ, writing) – Alan was the last remaining founding member of the band before he left at the end of 2010. Brian McNeill [1969–1990] (founding member; fiddle, writing) – Brian has published two detective novels. In 2001, he took up the post of Head of Scottish Music at the Royal Scottish Academy of Music and Drama in Glasgow, which he has since relinquished. Jim Thomson [1969-1973] (founding member, guitar, mandolin, tenor banjo, 5-string banjo, harmonica, tin whistle, vocals). Eddie Morgan [1969-1973] (founding member, guitar). Ricky Starrs [1973?–1976]; (guitar, mandolin, whistles) – Ricky played on the very first Battlefield Band album, the original Arfolk recording Scottish Folk (1976), later re-released (this very same year 1976) as Farewell to Nova Scotia on the Escalibur label. Jamie McMenemy [1977–1978] (vocals, mandolin, banjo, fiddle, Irish flute) – Jamie is still a very active musician and co-founder of the Breton group Kornog. He now lives in Brittany. John Gahagan [1977–1978] (fiddle, whistle) – John is now working as a graphic artist in Glasgow and continuing to play music. Pat Kilbride [1978; 2002–2005] (vocals, guitar, cittern, bouzouki) – Pat lived in Brittany, Belgium, then the USA, has recorded with "The Kips Bay Ceilidh Band" and done solo albums. Jen Clark  (vocals, guitar, cittern and dulcimer) – Among other things, Jen is now running a psychotherapy practice and offering voicework in Edinburgh). Duncan MacGillivray [1979–1983] (bagpipes) – Duncan has won many piping competitions, including the Gold Medal at the Northern Meeting in Inverness in 1997. 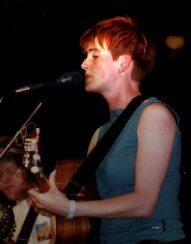 Sylvia Barnes  (vocals, dulcimer, guitar, bodhrán) – Sylvia came to Battlefield Band via Scottish folk group Kentigern (formed in 1978). Jim Barnes  (cittern, guitar, vocals) – Jim came to Battlefield Band via Scottish folk group Kentigern. He died in 2004. 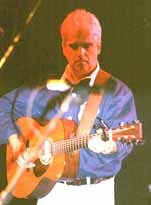 Ged Foley [1980–1983] (guitar, vocal, Northumbrian pipes) – Ged has recorded with The House Band, Patrick Street and Celtic Fiddle Festival. Dougie Pincock [1984–1990] (bagpipes) – Dougie is now director of the National Centre of Excellence in Traditional Music (Sgoil Chiùil na Gàidhealtachd) in Plockton. Alistair Russell [1984–1997] (guitar, vocal) – During his 13 years in the band, Alistair claims to have travelled one million miles. He currently has a solo career. 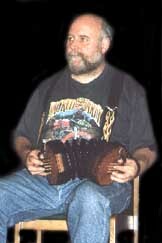 John McCusker [1990–2001] (fiddle, whistle, accordion, cittern) – John replaced Brian McNeill. Iain MacDonald [1991–1997] (bagpipes) – Iain was the musician in residence at the Gaelic College on the Isle of Skye. 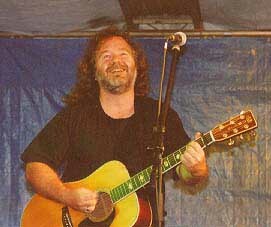 Davy Steele (1948–2001) [1998-2000] (lead vocals, guitar, bouzouki, bodhrán, writing) – Before joining Battlefield Band, Davy sang with Drinkers Drouth, Ceolbeg and Clan Alba as well as making solo albums. Ewen Henderson [2011–2014] (fiddle, Highland pipes, whistles, piano, vocals) – At the time he joined Battlefield Band (2011), Ewen was the youngest member. He left the band during 2014. From Wikipedia, the free encyclopedia [en.wikipedia.org/wiki/Battlefield_Band]. Wikipedia® is a registered trademark of the Wikimedia Foundation, Inc., a non-profit organization. Photo Credits: (1)-(4) Battlefield Band, (5) Alasdair White, (11) Mike Katz (unknown/website); (6) Alistair Russell, (7) Davy Steele, (8) John McCusker, (9) Brian McNeill, (10) Karine Polwart (by The Mollis).